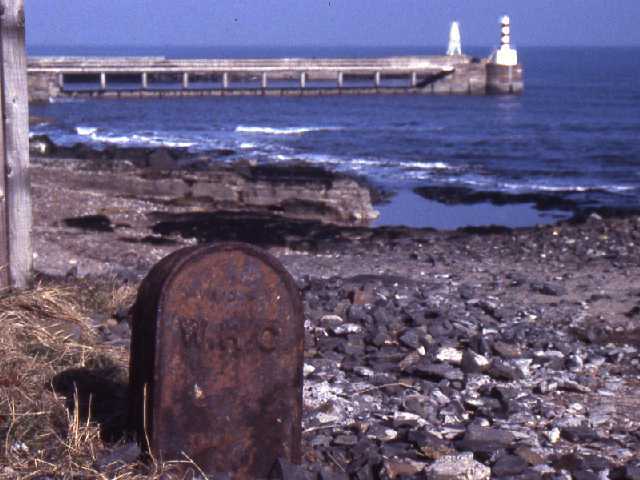 A harbour marker at Amble. 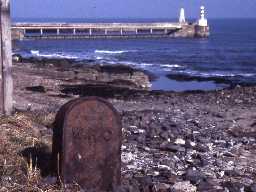 The village of Amble sits at the mouth of the River Coquet, opposite Coquet Island. Although most of the parish is to the south of the river, a small area is to the north, as a great storm in the 18th century changed the course of the river. The most important archaeological site is a Bronze Age cemetery. Many prehistoric burials have been found along the sand dunes to the south of the river. Some of these were probably originally placed under cairns or barrows. It was clearly once a large cemetery, and over 40 graves have been found. The position of this cemetery is unusual. It seems that the cemetery was put there to be seen from the sea, as well as from the land. After the Bronze Age there is little evidence for activity in Amble, until the medieval period. Although the village was very small, the remains of a stone building survive. This was probably the home of some monks from the Priory of Tynemouth. The biggest changes for Amble came in the 1830s. A harbour was built at the mouth of the river, and the small village became an important local port. The main exports were coal from Radcliffe and Broomhill collieries. Other goods to pass through Amble included pit props, timber, bricks and iron. Fishing was also an important industry. The fishing fleet bought back fish, mainly herring, to the village. Here, the fish were salted using salt produced locally. They were then exported through the harbour. This was a time of prosperity for the village. The population went from 200 in 1821 to nearly 3000 by 1891. Although the harbour has become less important for trade and fishing it still plays an important part in the life of the village. There is now a small marina, where pleasure boats are moored.